The popular Alienware M18x (see our review here) may soon be getting a revision with brand new Intel and GeForce processors. The unofficial Dell blog Dell-lab.com, which also happens to be the same source that leaked information on the to-be-announced 2012 XPS 15, has dropped more details on the still-rumored 2012 M18x refresh. Back in January, the blog gave first hints on the possible M18x R2, M17x R4 and M14x R2 updates with Ivy Bridge and Kepler options, but has now provided more details on specific configurable options for the M18x R2. In particular, the source claims that users will be able to equip the 18.4-inch Alienware with a 2.3GHz i7-3610QM up to a 2.7GHz i7-3820QM CPU and either a Radeon 7970M or GeForce GTX 675M in CrossFire or SLI, respectively. These monster specs are further configurable with SATA III HDD/SSD options up to 750GB/512GB and RAM up to 8GB, although additional details like connectivity options, features and possible chassis changes are unmentioned. The Dell Alienware notebook series has been receiving yearly hardware refreshes ever since it launched in 2009, so a 2012 update is practically a certainty. Whether or not the above information is correct, however, is a different story. 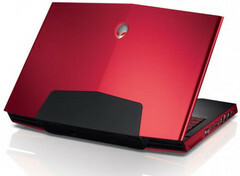 Until Dell officially announces the 2012 Alienware notebooks, launch dates and prices will remain unknown.